My little one is very into Rice Krispies and Marshmallow recently which is unusual for a boy whom were never into sweet stuff in the past. So I decided to be creative and make turn some of his favorite food into snack for him in my effort to fatten him up. Seeing how much he enjoys being in the kitchen experimenting with me, I got him involve in the whole process which excites him. 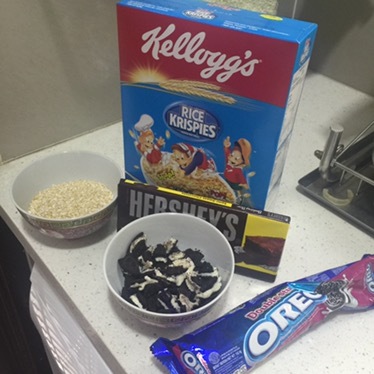 A perfect way to spend quality weekend together with him, making his favorite snack. Although it did not turn now looking very pretty, the taste were to our expectation. Not too sweet yet delicious. And most importantly, the little one loves it! Note: Store in the air-tight container without having to refrigerate the Rice Krispies treat. Is able to last up to 5 days in room temperature. Avoid direct heat as it will turn the Rice Krispies treat soft.